As the name suggests, this seafood restaurant is currently under the control of Michelin acclaimed chef Nathan Outlaw. Although chef Nathan is not permanently based in Dubai, like many celebrity chefs with restaurants in the region, he visits the property a few times each year and controls the menu. 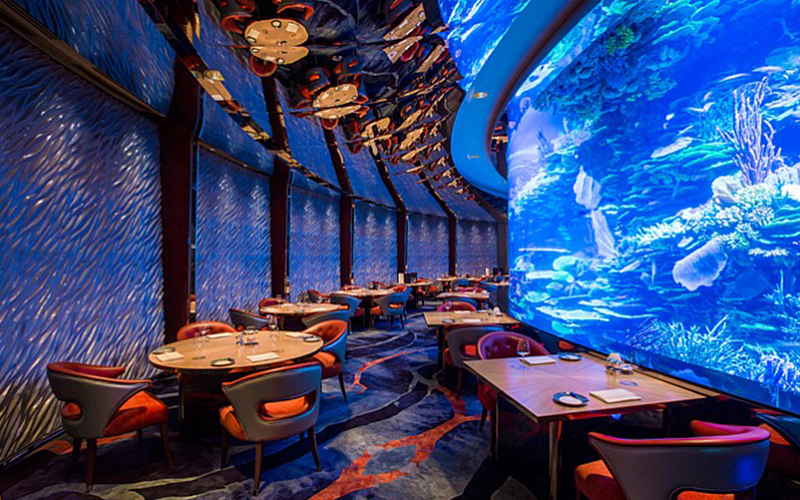 Situated underneath the Burj Al Arab, the theatrical aquarium takes centre stage in the restaurant, with views from each table in the restaurant. Like chef Nathan’s other restaurants, this one focuses on delicious seafood. Diners who have visited his flagship two Michelin star restaurant in Port Issac in the UK will be familiar with many of the styles and flavours on the menu. The standout dish of the evening was the fantastic Cornish Porthilly Oysters, caught close to the original Nathan Outlaw restaurant and flown out to Dubai. The deliciously fresh oysters are served with a red grape shallot vinegar and lemon and have a slight nuttiness in terms of flavour. For mains the tasty baked cod served with potted shrimp butter and courgettes is well worth a try, or if you’re sharing, the roasted whole Cornish turbot for two. From the sides the tasty minted new potatoes and the rocket and watercress salad work well with many of the dishes on the menu. Service was to the brilliant high standard that has come to be associated with both the Burj Al Arab brand and Nathan Outlaw. The drinks specialist could easily recommend flavours to pair with each of the different courses and dishes on the menu, whilst food was brought out promptly for each course. In line with the Burj Al Arab’s dress code, the restaurant has a strict no-shorts policy, so be sure to check out the website (listed below) for full details. BBC Good Food Middle East visited the restaurant on a Friday evening, and it was busy with a mix of well-heeled of expats and tourists staying at the Burj Al Arab. Details: for more information, visit Nathan Outlaw at Al Mahara. If you liked this article, you may like these reviews.